Charles, the owner of the Copper House B&B (who, incidentally, only does B&B for walkers) had warned me the day before that I’d probably be woken up by the cockerel at about 4am. Well if it did crow, I slept right through it – an unusual occurrence given I normally get woken up at the drop of a hat. Or Catherine’s snoring. Instead I woke up at the infinitely more sensible time of just before seven, leaving me ample time to awake from my slumber, break my fast and prepare for a days hiking. When we did the West Highland Way in the summer of 2009, Catherine had pointed out that the second day of walking is always the hardest. The first day you’re in optimistic mood – everything’s fresh and wonderful. And by the third day everything’s settled down. The rucksack starts to become far less noticeable, and your back becomes used to the weight. Your muscles have had two days good slog of exercise, so whilst they ache a bit at night, if you’ve stretched well the day before you’ll find them as good as new in the morning. But the second is difficult. It’s the day that the rucksack seems not to want to settle, and you get backache because there’s a heavy lump on your back. And it’s the day that all those walking muscles you haven’t used much for a while, complain the most. Your feet get the most sore as they adapt to boot life. And everything just turns into a slog, no matter how good the views. The best solution is to ensure you have a relatively easy second day. Don’t go beyond twelve miles if you can, and don’t over exert yourself. I tried it whilst doing the Cumbria Way. It worked. 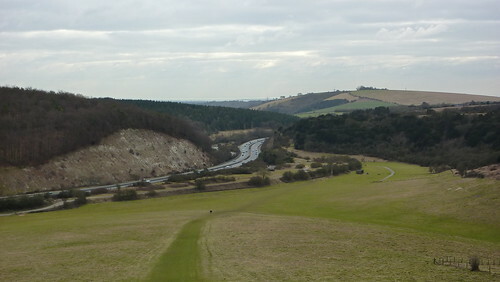 Whilst preparing for my second day, I realised that the way I’d planned doing the South Downs Way had left me with four second days. Four days when the rucksack would grumble and the muscles may ache. Oh and on this particular second day, I was also going to be breaking the distance rule. For in order to get to Petersfield for my train, I’d need to do fifteen miles – twelve on the South Downs Way and then a further three to Petersfield. Still, at least it wasn’t raining. Actually it didn’t look bad as Charles drove me down the road back to Exton, stopping off at the fabulous Meonstoke Village Store for some provisions. A bit cloudy; a bit on the cool side. However for a February Saturday, it didn’t look half bad. 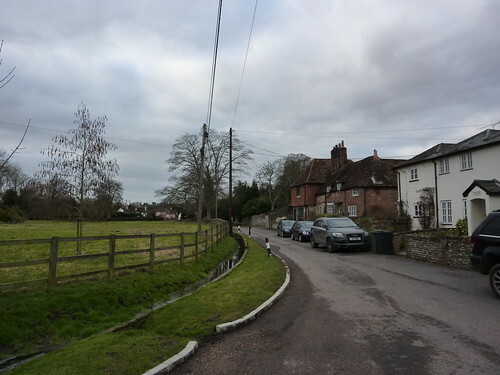 Walking past large groups of dog walkers, I strolled out of the village and on my way to the first challenge of the day – leaving Exton. The route from Beacon Hill through Exton is currently a temporary route, and labelled as such on several signs. And it’s not perfect, which was shown on my attempted exit from Exton. 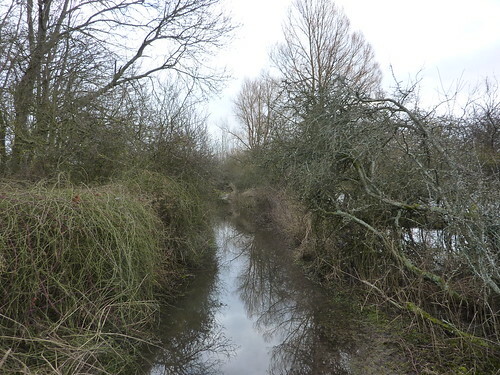 The temporary route was supposed to go alongside a stream, however I found it was more “pool” than path. My guide book proclaimed that it’s often impossible to use at this time of year, and that most people instead use the stream bank instead. This naturally involved climbing over a broken wire fence, and scuttling along a very narrow and overgrown stream bank fighting off trees. With a large rucksack on, this proved to be a serious challenge. Even when the footpath finally became usable, there was fun with fallen trees and more. Not exactly the best start to the day and I was more than happy when the temporary route passed over an old railway line and became the proper route in much better condition. 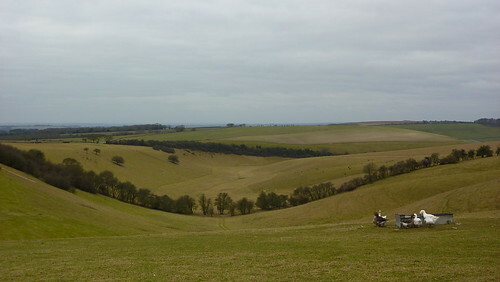 As my muddy boots and legs began to dry off, I began the gentle climb up Old Winchester Hill – the first landmark of the day. 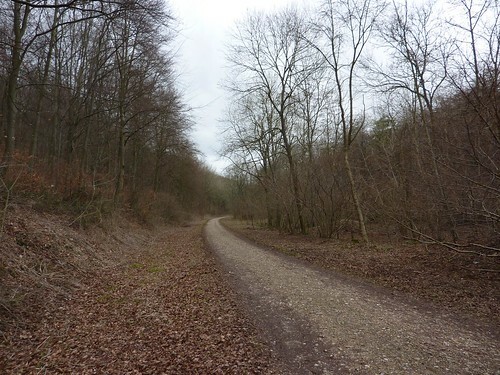 From the direction I was heading to it, it looked nothing special – just a small hill with a wood on it and a nature reserve. Even at the top it seemed little more than a place providing excellent views of the South Downs and beyond – providing me with my first of many glimpses of the Isle of Wight. It was only having left the hill that I found out it’s actually the site of an Iron Age fort, with a huge raised ring surrounding the ring top. 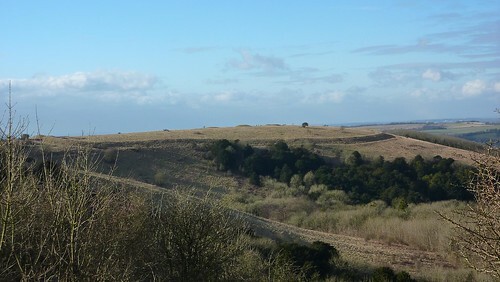 Within the fort are also a number of Bronze age barrows. It was a lovely sight which was coupled with a lovely blue sky which gave a spring to my step and some joy to my spirits. After being on the relative high levels of the hills for a bit, the Way went down hill towards more farmland and a surprising amount of middle aged women with black labradors, before I arrived at the next, even more surprising landmark. Whilst skim reading my guidebook (the official South Downs Way National Trail Guide by Paul Millmore), I’d seen some odd sounding references to HMS Mercury. Now if I’d read the book properly I would have known what to expect, however the book is rather annoying in that it starts from Eastbourne and ends in Winchester, which seems completely bonkers. I mean, who wants to start a walk at the sea and end in a cathedral city? No. The sea should be at the end! It’s a natural end point! Because of the book’s direction being different to mine, I was using it more for the excellent OS maps it contained rather than the text. As such I hadn’t read about HMS Mercury other than that the Way passed by the “remains” of it. 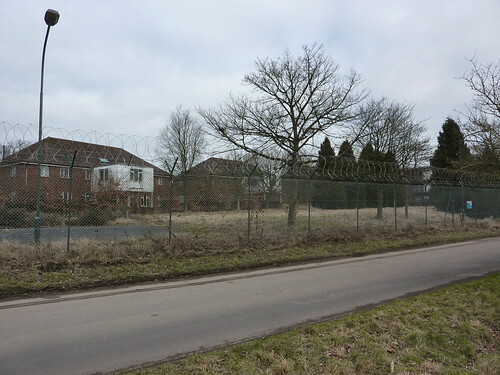 I had images of some rotting battleship or something, however it turned out that HMS Mercury is actually an old Naval Comms school which was shut down in 1993. It was a sizeable complex, however it felt like walking round a ghost town. The Way went alongside a main road outside the complex, which was deserted. I half expected to see grass growing out of it. 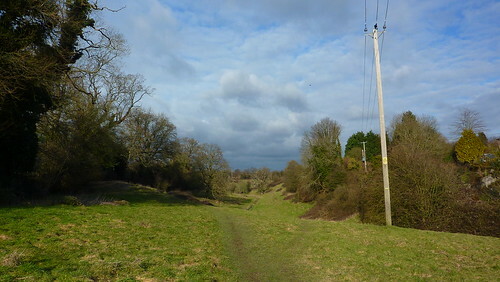 It was lined with tatty lampposts which looked like they hadn’t been maintained for years – and given the base of them was inside the wire fence surrounding Mercury, is probably the case. Yet despite the ghost town feel of the place, there were things here. Several old logs lined the wide pavement opposite Mercury and I stopped for a rest and some food to take it all in. Across the road from HMS Mercury was a café in a place called The Sustainability Centre. Down the road was a large village. Yet there were no cars; the only people walkers and cyclists who all seemed rather bemused. 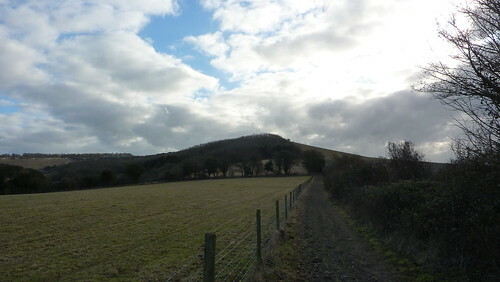 Finally leaving the eerie sight of HMS Mercury, I headed on to the next stage – Butser Hill. 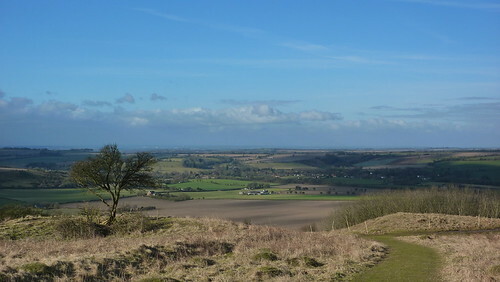 One of the highest points in Hampshire, it provides good views all around – or would do if I’d popped up to the actual top. For some reason I didn’t – just close to it – settling down for another bite to eat overlooking a nice view somewhere in the distance. 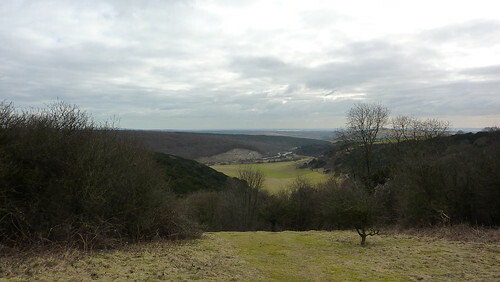 I headed downhill to the noise of a busy road and, on the other side, the Queen Elizabeth Forest – part (along with Butser Hill) of the Queen Elizabeth Country Park. Although it hadn’t been as quiet as the day before, to suddenly find myself in the bustle of a busy country park visitor centre and car park was a slight shock to the system, although I was heartened to find that most of the visitors clearly didn’t make it beyond the children’s play area as once I’d passed by and was walking through the forest, peace was restored once more. 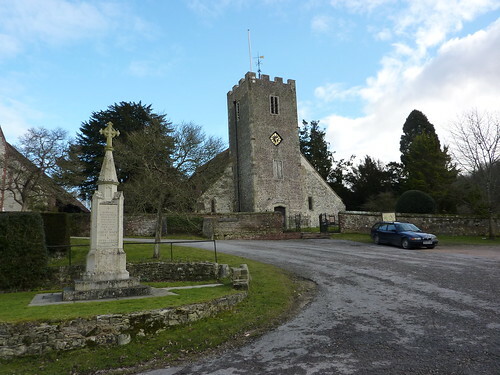 Once again I was making excellent progress, and found myself at Buriton an hour earlier than planned, arriving at 2pm. 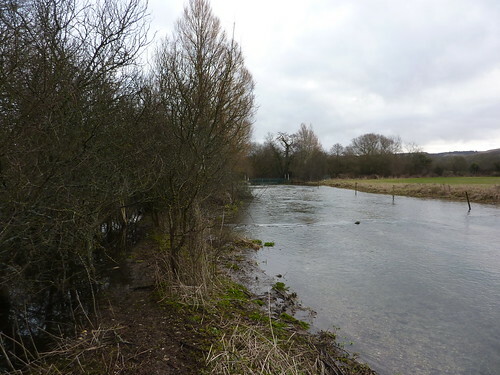 It would be here that I’d leave the South Downs Way for the time being – the nearest train station was three miles away at Petersfield following the Hangers Way, passing first through woodland and through the picturesque village of Buriton itself. An easy going grassy path led me towards Petersfield, however the curse of Day 2 began to strike as I found my little toes feeling rather sore. My hiking boots were relatively new, and whilst I’d worn them a few times, I hadn’t worn them for much more than three quarters of a day. Something suggested they needed a bit more breaking in than I’d given them (although the week later, I pondered whether I’d also done them up too tightly). Although not hobbling or in agony, I was looking forward to having a sit down and taking them off! Thankfully Petersfield was not far away – a town which proved to be rather infuriating as, despite erecting several signposts for pedestrians, the council clearly had decided that there was no way people might want to get to somewhere as obscure as a train station which led me to wander aimlessly around the shopping district, hoping I was going in the right direction. I finally found a sign (broken) for the station, although by that stage the place was in sight. Hi i was interested in reading one of your reports on your walk on the south downs way. can you give some advice please, myself and 4 others are planning a charity walk the whole of the 100 miles of the south downs way in 2016. We are aiming to hit 20 miles a day and using b and b accommodation along the way. In your opinion is it possible to maintain 20 miles a a day or should we aim for a lesser distance on the 3rd day. I am inspired your tales and photos. 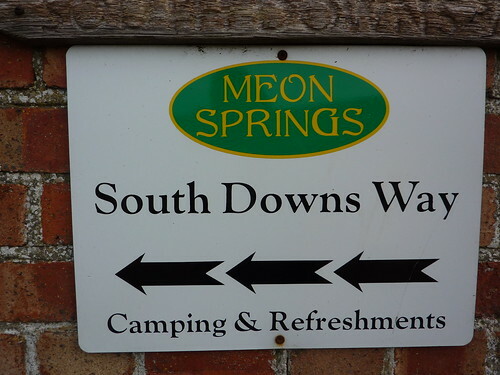 My husband and I are planning to walk the South Downs Way in September 2016. We are interested in staying at the Copper House B&B with Charles. Do you know if he still takes walkers? If yes, do you have an email address for him. Hello Joyce – I am afraid I don’t know if Charles at the Copper House is still doing B&B. I only ever saw him listed on the National Trail website and he’s no longer on there so I would guess not. The Copper House was on the same site as another B&B – if my memory serves, it’s Corhampton Lane Farm – which was run by his daughter. That’s a big help. Thank you very much. First Published: 24 February 2010. Last Updated: 16 November 2014.